To support the research activities of TCLD, four essential cores were developed: the Administrative Services Core (A), the Dissemination and Training Core (B), the Data Management and Statistics Core (C), and the Assessment and Recruitment Core (D). Core A provides administrative support to TCLD, including fiscal management and communication among investigators and across sites. This core is funded by the Eunice Kennedy Shriver National Institute of Child Health and Human Development (NICHD) and is led by Jack Fletcher of the University of Houston. Core B, funded by NICHD and the Texas Education Agency, promotes training activities at the graduate, postdoctoral, and early-stage-investigator levels and disseminates research-based information on learning disabilities identification, intervention, and response to intervention to schools, parents, and other researchers. Core C, led by David Francis of the Texas Institute for Measurement, Evaluation, and Statistics at the University of Houston, provides data management and project-specific analyses of data. This core is also funded by NICHD. Core D hires and trains assessment personnel, performs core assessments needed for the current research projects, and recruits schools and participants for the current research projects. 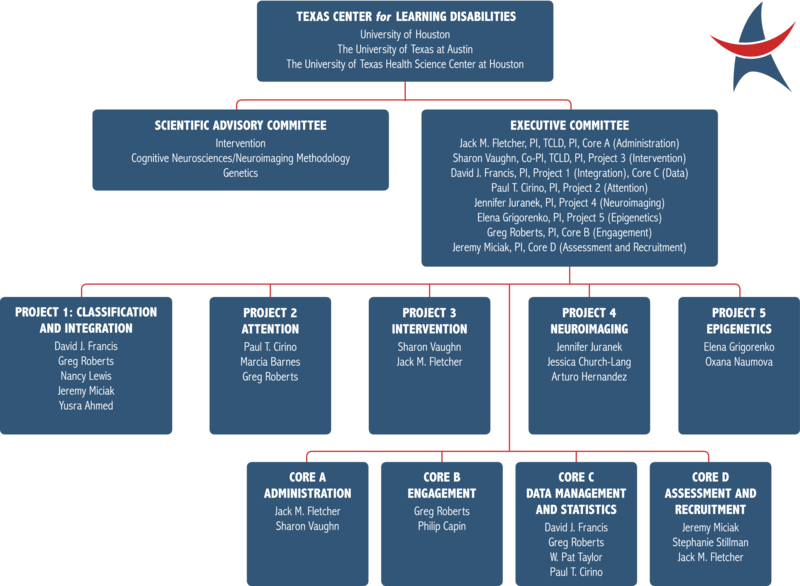 This core is funded by NICHD and is led by Jeremy Miciak of the University of Houston. Click below to enlarge the TCLD Organizational Chart.